If you think that it’s unethical or immoral for guitar teachers to want to earn a lot of money, then leave this page now…but if you want to learn how to add overwhelming musical value to the lives of your students and be rewarded generously for it in the process, then study ALL of the resources below. Save yourself years of frustration by avoiding the most common mistakes that guitar teachers make. Study these resources to learn the best way to teach guitar, so you can become the #1 guitar teacher in your area. Learn more. 5 Roadblocks That Ruin Your Guitar Teaching Business NEW! Why do so many guitar teachers get stuck earning only a modest living teaching lessons? They use the same mindset, strategies and models. Learn how to not end up like them and make great money teaching guitar. The greatest challenge you face as a guitar teacher is overcoming your irrational fears. Your fears keep you from providing maximum value to your students and limit your income. Learn 7 common mistakes guitar teachers make (due to fear) and how to overcome them. When you struggle as a guitar teacher, you are falling short in one (or more) key areas of your guitar teaching business. Learn how to identify and overcome these weaknesses and build a successful guitar teaching business. Only a few guitar teachers will achieve the highest level of success – earning 6-figures+ per year and producing excellent guitar students. However, everyone has the potential to do this... including you. 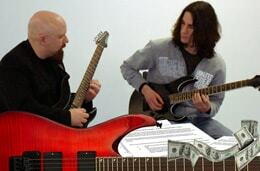 Learn how by reading this guitar teaching success article. Whether you have been teaching guitar for a long time or have just started, you the potential to achieve massive success and earn more money than you ever thought possible. All you need to become a massively successful guitar teacher are 5 key qualities. Learn what they are so you can earn more money, teach more effectively and produce better students by reading this article about becoming a successful guitar teacher. “Guitar teaching insanity” is what happens when you try to copy everything that other guitar teachers are doing in an attempt to build your teaching business. This approach almost guarantees failure since most guitar teachers have no idea what it takes to truly grow a successful teaching business. Read this article to learn 6 reasons why copying other guitar teachers doesn’t work and what you must do instead to make good money teaching guitar. Earning a 6-figure income as a guitar teacher is NOT just a fantasy... it's much more achievable than you think. Fact is, most guitar teachers do not make this much money because they are too concerned with external factors such as a being in a "bad economy" or what their competitors are doing. This causes them to make critical mistakes that keep them from ever making good money. Learn the 5 main mistakes that prevent guitar teachers from making a good living (plus what YOU should be doing to make 6-figures each year) by reading this article about how to earn tons of money teaching guitar. The very first thing you need to make a lot of money (6 figures per year) teaching guitar is the right business model. You need to stop ‘only’ teaching one-on-one lessons and adopt one of many other innovative guitar teaching models that will make your students better players faster, make lessons more affordable for them and MASSIVELY increase your income in the process. Watch this to learn how to expand your guitar teaching business. Most guitar teachers think that there are only 2 ways to earn more money: 1. get more students and 2. charge more money for lessons. Fact is, there are DOZENS of ways to quickly and easily increase your income from teaching even if you hate marketing and don’t want to charge your students more money. In this free eBook, I show you 11 easy ways to earn more money teaching guitar, get a lot more students and become a much better guitar teacher. Download it now and start earning more money teaching guitar. Learn 10 of the most common reasons why so many guitar teachers struggle to make ends meet, earn only a small fraction of the income they should be earning and hurt their own students by their lack of financial success. Read this article now so you don’t repeat the same mistakes and understand how you can earn A LOT more money teaching guitar. Even those guitar teachers who genuinely ‘try’ to earn more money from teaching often destroy their chances of success by following traditional ‘common sense’ tactics in their businesses. These ideas appear perfectly logical, but they WILL hurt you in big ways. Read this article to protect yourself from certain failure as a guitar teacher. Your guitar students are the lifeblood of your business. Learn all of my very best strategies, tactics, tools, techniques and secrets for filling your guitar teaching schedule and have students choose you over any other guitar teacher in your area. These are the very same methods I’ve used to become the dominating guitar teacher in my town (years before I started teaching online) and that I’ve trained hundreds of guitar teachers to use to build their highly successful businesses and music schools. Learn how to attract guitar students like crazy.